Whether you want to transport trolleys on escalators smoothly, be able to supply brakes for customers trolleys while loading their vehicles or reduce the static conduction on your trolleys, Wanzl has a range of very high quality and long-lasting wheels. Transporting goods smoothly and safely on escalators makes very specific demands on trolleys and castors. 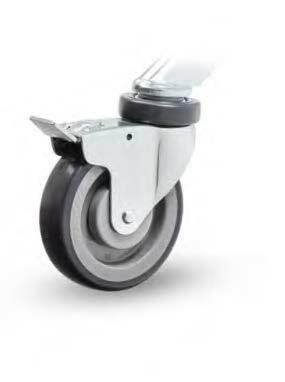 Original Wanzl travelator castors have been developed on the basis of many years of experience and when combined with Wanzl shopping and transport trolleys, provide the ideal conditions for smooth travel between floors. Can be fitted to any trolley.